On 26 October, Rajshree College, Bareilly hosted a Business Plan Competition for students from across colleges in Uttar Pradesh. The event recognized the tremendous potential of Kalam Centre for Innovation and Incubation of Startups (K-CIIS), which intends to encourage startup culture across colleges and create an ecosystem for promoting innovations and startups for students and alumni of Dr. A.P.J. Abdul Kalam Technical University, Lucknow. Overall ten teams took part in the competition, which had Mr Saurabh Singh (Consultant, K-CIIS) as the judge. The participating teams presented unique business ideas that attracted attention and caused much excitement among members of the audience. In the end, the top three business plans with the potential to make a difference in the future got selected. 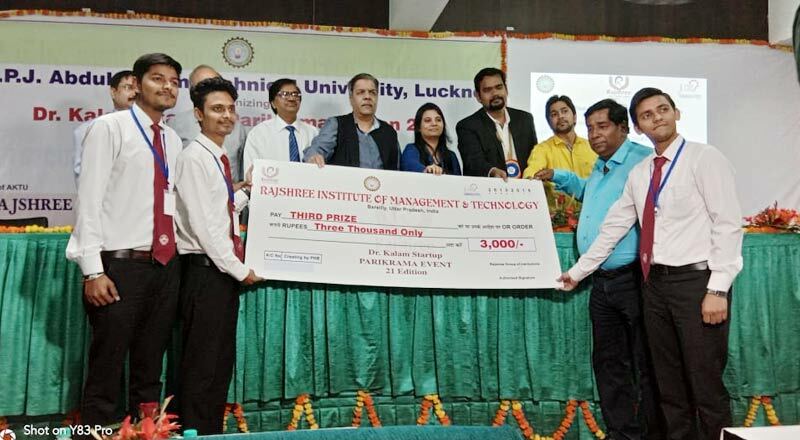 The First prize of INR 10,000/- was won by Rajshree College, Bareilly; the Second prize worth INR 5,000/- went to Future College, Bareilly; and the Third prize of INR 3,000/- was won by Shri Ram Murti Smarak College of Engineering and Technology, Bareilly. The team from SRMS CET was guided by their college faculty coordinator Mr S.K. Suman. The Business Plan Competition brought students from diverse colleges on a common platform to interact with each other, exchange thoughts and ideas, and thrive in a culture of learning and innovation. It played its part in promoting the culture of startups among young learners.